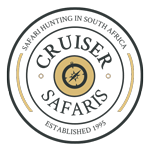 Cruiser Safaris Hunting Information: firearms and ammunition. There should be no reason to purchase a new rifle for your South African safari. The most important factor is your knowledge and comfort in your ability to shoot your own rifle accurately. The rifle you use for deer hunting is probably adequate for any type of plains game you may hunt. Being familiar with your rifle and practicing in several positions, including utilizing shooting sticks, will go a long way toward a successful safari. Accurate shot placement is much more important than a large caliber rifle. Be sure to have a quality scope fitted to your rifle. A 3x9 variable scope is common, but the choice is left to you. All shots should be in the 50 - 250 yard range with 100 yards the average in the Limpopo Province. Any .30 caliber rifle is adequate for most plains game, however for buffalo the law dictates a minimum of .375.